Quileute has just completed a major assessment of restoration needs (report in pdf format) in the Quillayute River Basin and prioritized restoration projects. This was a combined effort of the tribe, other governments in the basin, and stakeholder timber operators. An Excel file lists all the projects reviewed by landowner spreadsheet pages. The Quileute Tribe is fortunate to be situated in a wilderness region with relatively pristine air and water. However, issues do arise in the context of protecting the natural resources from environmental degradation that can occur from human activity. Most of our actions are focused on protection of water quantity and quality for salmonids, a family of fish with both ceremonial and subsistence significance. There is also a commercial river fishery. We address the protection of salmon streams in a number of ways. The tribe is a signatory to an interlocal agreement under state law RCW 77.85, for salmon recovery funding. It belongs to the North Olympic Lead Entity Group, which is comprised of Clallam and Jefferson Counties; the cities of Forks, Port Angeles and Sequim; and five tribes: Hoh, Quileute, Makah, Lower Elwha Klallam, and Jamestown S’Klallam. This group plans salmon recovery strategy for the region and reviews and scores grants to accomplish salmon restoration. The tribe is also a signatory to an interlocal agreement under state law RCW 90.82 for watershed planning. The local planning unit for Water Resource Inventory Area (WRIA) 20 includes: Clallam and Jefferson Counties; City of Forks; and the Hoh, Quileute, and Makah Tribes as Initiating Governments. Other members of the planning unit include WA Department of Ecology, other state agencies, federal agencies, timber, and members of the general public. This group is winding up the planning effort for public presentation and hearing, in early 2006. The Clallam County website for watershed planning is not yet built for WRIA 20. Meanwhile, refer to the generic page from Ecology, linked above. The tribe has been active in Timber Fish Wildlife since its inception in the 1980s and in Forests and Fish negotiations that culminated in the Report of April, 1999. Our TFW biologist participates in Northwest Indian Fisheries Commission and WA Department of Natural Resources meetings in which the laws and regulations of timber operations are continuously reviewed for revision. He and tribal technicians also participate in “ID” teams to review proposals (Forest Practice Application and Review System) for cutting timber in the Quileute U&A. Any operations proposed for work in stream channels are also reviewed: Hydrologic Permit Applications, but these go through WA Department of Fish and Wildlife. Salmon habitat restoration in the field is a major part of QNR’s activities and is achieved through grant funding, for the most part. QNR’s in-house environmental attorney writes the grants to support a number of habitat programs for fish and wildlife. A list of projects over the past 10 years, showing the partners who shared in planning, costs and operations, can be found at the end of this web page. She also represents the tribe at the state salmon recovery and watershed meetings; and at USFS’s Olympic Province Advisory Committee and Resource Advisory Committee as an appointee of the Secretary of Agriculture. She attends tribal meetings of the NWIFC relating to water quantity, water quality and environmental policy. Recently the attorney and the TFW biologist have been engaged in programs to eradicate invasive weeds that impair the watershed. Clallam County Noxious Weed Control Board has been spearheading this effort in the region. 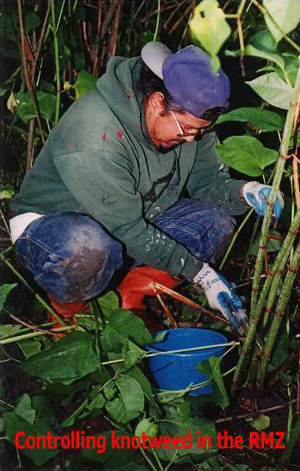 Quileute has received two grants to eradicate knotweed in the Dickey River and is working to assess knotweed presence in other rivers of its U&A. We are active in the Olympic Knotweed Working Group, an association of government, timber, and concerned citizens. 4. E-W Fork Dickey Watershed Analysis (1997-98)—Tribe worked on pilot for Water Quality Module of state process, and on fish and riparian modules. Reconstruction of old stream channel and joinder with that upstream, where WW2 road had blocked channel access to Sol Duc, and installation of culvert, at site called Prairie Falls (2000) w/Rayonier, private landowner, WDFW, Clallam County. Replacing culvert with bridge at Haehule Creek, where alluvial fan was being formed by sediment blocking culvert per WSA (1999) w/Rayonier+WDNR. Installation of LWD, alder suppression—Middle Fork of Dickey (2004), w/Rayonier. 11. Wetlands Mapping in Dickey Watershed and Reservation (1997-1998) ONP, mixed private ownership. 14. Water quality sampling in Quillayute mainstem (2002-2003) using Datasonde by Hydrolab. Federal partners and/or funding agencies include Bureau of Indian Affairs, U.S. Environmental Protection Agency, Olympic National Forest of the USFS, and Olympic National Park. State partners and/or funding agencies include Washington’s Department of Ecology, Department of Natural Resources, Department of Fish and Wildlife, and Salmon Funding Recovery Board. Local government partners include Clallam County and City of Forks. Private partners/funding entities include Rayonier, Inc. and a number of individual small landowners. Thanks to all of the above.